By God's grace Rajon is doing good and recovering from Fontan Completion with Extra Cardiac Conduit surgery at MIOT Hospital, Chennai. Doctors removed him from the ventilator support. Thank you all for your love and support. Keep praying for his speedy recovery. 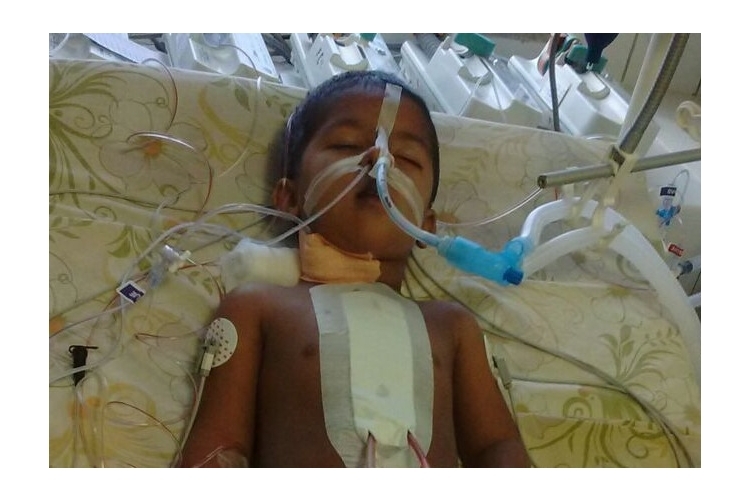 Rajan is a 4-year-old baby who has to undergo a third open heart surgery. He always has a smile on his face but is fighting for his life. Please join hands with us in raising Rs.3,10,000/- to support Master Rajon Samuel’s surgery and help his family through these difficult times. Master Rajon S/o Mr. B. Praveen Kumar, resident of Warangal was evaluated at the MIOT Centre for Children's Cardiac Care, Chennai. He is diagnosed to have complex Congenital heart disease: Dextrocardia, Double inlet ventricle with transposed great vessets, severe Left AV valve stenosis, mild PS, severe pulmonary hypertension and was advised surgery in 3 stages. The first stage of surgery: PA Banding + Atrial Septectomy and second stage surgery BDG was done by Dr. Robert Coelho at MIOT. Since Rajan’s father used to work with an NGO called Compassion India, they have supported Rajan’s first and second surgeries. Due to government issues, compassion India has been shut down in the month of February/March 2017. Rajan’s father doesn’t have job now and mother is a school teacher. They can’t afford that much amount now. They are in lots of emotional and financial stress. Master Rajan has to undergo his third open heart surgery (Fontan Completion with Extra Cardiac Conduit) between 25th of August to 27th of August 2017. Please contribute to save Rajan's life and help his family through these difficult times, with a donation of Rs. 1000, Rs. 5000 or Rs. 10,000, so that together we can strengthen this little fighter and be agents in wiping their tears and bringing back joy into his life and family. Your generosity and concern will be richly rewarded when you see the smile on the face of a child who bears the scar of a brave heart across his chest! We thank you in advance for your contribution and appreciate your involvement in this life-giving cause. I am so glad to inform you that by God's grace Rajan's surgery was successful. Though it took more than 7 hours of surgery, everything went off smoothly. He is currently under observation will be in ICU for few days. Thank you once again for your prayers and financial support. I will keep you posted on his progress. Keep praying for his speedy recovery. I am very thankful for the love that you all had poured upon us through your loving contributions. We are able to join our son in MIOT hospitals for the final stage open heart surgery. Yesterday 2d echo was done and today blood investigations, ecg and xray is going on. Dr. Robert had told that they will do cardiac catheterization on Monday, your valuable suggestions and loving contributions through the intiation of Noel foundation (sudheer Anna, Hilda Akka), prithiv sir and Joshua brothers, we are now in hospital. I thank all..... Thanks Sagar, geetha and friends in USA, INDIA, UK. Megha, prathibha, ramakanth, Pradeep, madhu, Arun, Hari,Swathi T, Aruna, Bharath, Venkat k, Sridhar, Rakesh A, Baskar C, Pavan v, Subash D, Shekar D, Shekar G, Sathish D, Naveen, Jithendar, Kishore M, Pramod, Arjun, Srinu N, Raga, Pavan G, Saisree T, Chaitanya P, Veeramurali T, Kapil, warm wishes from near and dear. Relatives. If possible, I request all friends and relatives, continue to pray for Rajan's surgery. Bow before God who made this event impossible to possible. Thanks once again for all of your generosity and love. We are grateful to everyone in this group for your contributions and prayers for the Rajan's cause. With your help, we have reached almost 99% of the surgery cost. A heartfelt THANK YOU to everyone who have made this possible in short span of time and appreciate your involvement in this life-giving cause. Rajan’s admission has been rescheduled to 1st September 2017 by the Hospital. Next three days will be crucial as he is not supposed to get any sickness even cold. Continue to pray for the Rajan's health. We will keep you posted on the progress. Thank you for your kindness and generous support. With your help, we have reached almost 99%. We need another Rs.3500/- ($55) for the surgery. Since this campaign is going to expire another few hours, I kindly request you to contribute if possible or please share the campaign with your friends to help us reach the goal. Kindly help us to reach the remaining 1% goal. Your contributions and support are truly strengthening our hopes for giving Rajan a healthy and long life. The virtue of charity has incredible power to open people to God, to bring light out of darkness and hope from despair. This is a true incident in the life of Mother Theresa. She used to go in search of well-to-do people and seek help for the people who were struggling for their life. One rich guy who hates these kind of activities & people, used to frown at her all the time. But Mother Theresa, politely approached him and asked for help. At the peak of anger, the rich man spit on Mother Theresa's face and started scolding her. The divine Mother, patiently cleared it and with unimaginable patience asked him, "Thanks for what ever you gave me, but what will you give to help my poor people". The rich man got stunned by her response and gave her sufficient funds to help the needy people. She never had ego while helping people, which most of us have when we do such activities. Her only intension was to reach out for people who are in need and help them. She always believed that she's just a tool being used to help others. She never took the pride of her achievements. We should try following her path to the maximum extent possible. Thank you once again for your transformational donation and generous investment, which brings hope to the heart kids’ families. PS: If it is possible, you can share your contact details to me at hildasudheer@gmail.com or info@noelfoundation.in for more updates. We are grateful to everyone in this group for your contributions andprayers. A heartfelt THANK YOU to everyone who have made this possible in shortspan of time and appreciate your involvement in this life-giving cause. Rajan’s admission has been rescheduled to 1st September 2017 by the Hospital. We will keep you posted onthe progress. Continue to pray for the Rajan's health. We are grateful to everyone in this group for your generous contributions and prayers. This would not have been possible without you. For the past week days, our son was not doing due to cold and cough and fever, by God's grace and best wonderful wishes our son Rajon Samuel is recovering. If GOD's willing we will be there in Chennai for admission at MIOT hospitals on 28th August. I request you to continue to pray for Rajan's health. Thank you once again for your support, love and prayers for our beloved son. - Rajan Samuel's father Praveen and family. Thank you for all your tremendous support so far for Rajan! We are grateful to everyone who came forward to help us. Since Rajan's operation cost itself is Rs. 3,10,000, we are increasing the current goal amount by a bit to absorb the fees and other expenses that will emerge post operation, so that we can continue with Rajan's care! Thank you once again for your support and prayers! Today is a very special day for Rajan - miracle baby-celebrating his 4th birthday. Join us as we celebrate Rajan Birthday and continue to pray for him as he prepares for the open heart surgery next week and for the needed funds. Thank you all for your continued prayers and generous support. I request you to please keep sharing this to your circles of friends and family. Every share will help get better reach to help Rajan's cause and help his family through these difficult times, so that together we can strengthen this little fighter and be agents in wiping their tears and bringing back joy into his life and family. Thank you for your generous support and prayers for Master Rajan. With your help, we have reached thus far, but there is a long way to go. Need your help to share the campaign so that we can reach the goal. The response has been amazing but need your help in this crucial time to save Master Rajan. We are scheduling Rajan's surgery within 7 days at MIOT hospital. We will keep you posted on the progress. Thank you so much for the love and support towards Rajan’s cause. Your share could be as good as a donation for Mr. B. Praveen Kumar! Not everyone can afford to take care of their loved ones. Mr. B. Praveen Kumar's life can only be saved by donations made by kind people like you.